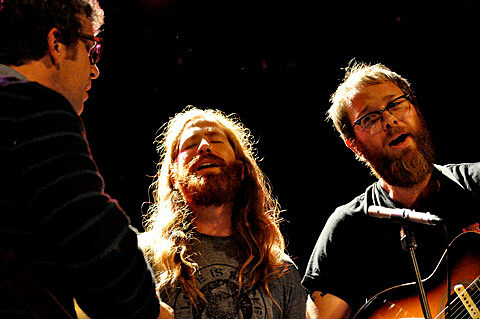 North Carolina psych-folk band Megafaun (not to be confused with Megafauna who are playing Mohawk Tuesday night) are playing Mohawk on April 10th, with Field Report. Advanced tickets are are on sale. Though they’re playing shows around Europe now, Megafaun will be back in the states in March, with the Mohawk show toward the end of their 2012 North American tour which also includes a quite large NYC show at Highline Ballroom and FESTIVAL EN EL BARRIO in Tucson with CALEXICO, GRUPO FANTASMA, SERGIO MENDOZA Y LA ORKESTRA, AND MORE. And even while they’re overseas, the band is gaining stardom in living rooms across the U.S. Though most probably didn’t recognize it (like Ryan Matteson did), their song, “Hope You Know”, was used in a Toyota commercial which aired during the Super Bowl last night. Too bad their Austin show isn’t later in April because they could maybe have met up with their friend and former bandmate, Justin Vernon, as Bon Iver is apparently set to do a taping for Austin City Limits on April 25th.